Normic offers Nameplates and Decorative Trim in a wide variety of materials and finishes. Aluminum nameplates, for example, have been the standard for decades. They can be printed with highly-durable, oven-cured graphics and coatings that provide weather-resistance and protection from chemicals or abrasives. Aluminum can be processed to look like other metals such as bronze or silver, and Normic can spin, brush, emboss and diamond-cut it to provide a variety of distinctive finishes. Many flexible plastic substrates are also available for nameplates, such as polycarbonate, polyester, polystyrene and vinyl. 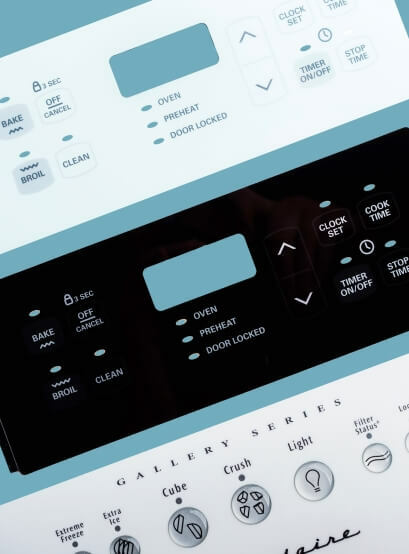 Available in transparent, frosted or metalized varieties for special effects, these substrates are also easy to emboss and form with inexpensive tooling. 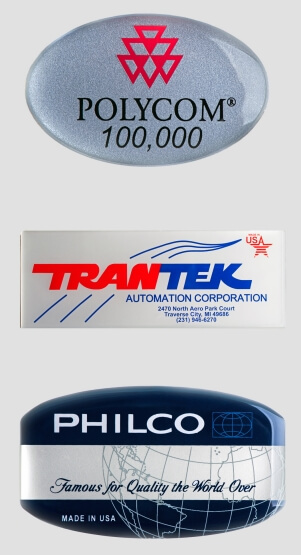 Normic Industries can assist your company in designing and engineering your nameplates. We can provide a wide variety of graphic effects including solids, halftones, metallic and transparent colors; simulated natural finishes such as faux granite or wood; and abstract textures. Hot Stamped and Luminescent graphics are also available. For a more dramatic effect, we can supply nameplates and trim incorporating our ClearLens doming, a topically-applied, transparent urethane that adds visual depth to your product, significantly enhancing its appearance. See our ClearLens product page for more details. Copyright © 2002 - 2017 Normic Industries, Inc. - All Rights Reserved. Website Design by Target Marketing Solutions, Inc.